UPDATE 4:45 PM : FIRE crews will remain on scene overnight to strengthen containment lines at a blaze burning near the Bruce Highway at The Caves. 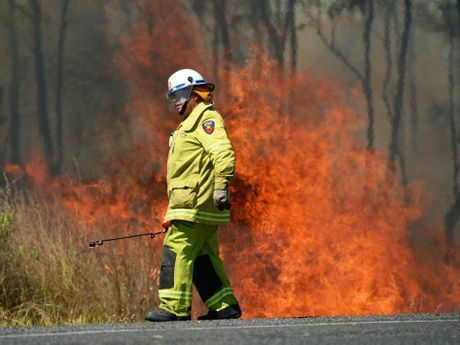 The grass fire near Yaamba Road (Bruce Highway) and Rossmoya Road broke out around midday and is now contained and no threat to homes. A large smoke haze continues to affect the surrounding area. Residents should close windows and doors and if suffering from a respiratory condition, keep medications close by. Motorists should drive with caution and to conditions. If residents are concerned their property is under threat, they should call Triple Zero (000) immediately. BREAKING: QUEENSLAND Fire and Emergency Services and Queensland Rural Fire brigades are battling up to six blazes across the region today. Information from the Rural Fire Service indicates there are vegetation fires burning at Yaamba Rd and Rossmoya Rd at The Caves, Fishing Creek Rd at Woodbury, Pine Mountain Drive at Bondoola, Caporn Rd and Yeppoon Rd at Limestone Creek, Moores Creek Rd at Park Avenue and Jellicoe Street at Port Curtis. All of the fires have started in the past two hours. Checking and patrolling outside for embers, extinguishing any spot fires and seeking shelter as the fire front arrives. Regular updated information will be provided on the Rural Fire Service Queensland (RFSQ) website at www.ruralfire.qld.gov.au or listen to local radio.